As President of the Colorado Rapids, Tim Hinchey will discuss the direction of professional soccer in Colorado and the United States. He will also share his perspective as part of the Kroenke Sports organization on the changing model of professional sports as it pertains to the fan experience, ticket prices and the business side of sports. Mr. Hinchey’s background should add wonderful color to the discussion – he has worked in US Soccer, Olympic Soccer, English Premier League as well as the NBA and NHL in the US. He will also explain how the Rapids had their most successful year in club history in 2013, setting record marks in sponsorship revenue, earned media, and attendance, including an increase to more than 5,000 season tickets. With Hinchey’s direction, the club opened the Chairman’s Club, modeled on the European-style directors’ box/boardroom, and the Summit Club powered by 2lemetry, the Rapids’ first true VIP hospitality club for premium customers. 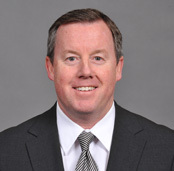 Tim Hinchey was named President of the Colorado Rapids on December 12, 2011, bringing more than 20 years of experience in professional sports in the United States and England to the role. Having originally joined the Rapids in November 2010 as the club’s Chief Marketing Officer, Hinchey has overseen growth and development of the franchise, including increased attendance and sponsorship revenue, and a more than 100% increase in season ticket holder accounts. He also serves as a member of the Arsenal Broadband Board for the Rapids’ partner club, Arsenal F.C. Before coming to Colorado, Hinchey served as the Vice President of Commercial for English Football League Championship side Derby County for three years. Before joining DCFC, Hinchey was with the NBA’s Charlotte Bobcats as their Executive Vice President of Business Operations. He previously served as senior vice president of corporate development and chief marketing officer for the New Orleans/Oklahoma City Hornets. Among his responsibilities was the start-up of the team’s relocation to Oklahoma City and its subsequent success in ticket sales and corporate development. His start in professional sports began with the Los Angeles Kings in 1991 and continued as vice president of marketing and corporate sales for the Utah Grizzlies and the E Center (ice hockey venue for the 2002 Olympic Games), senior vice president of business development for the Long Beach Ice Dogs and director of strategic alliances for Maloof Sports & Entertainment, where he developed strategic and innovative plans for all corporate partnerships integral to the NBA Sacramento Kings, WNBA Sacramento Monarchs, WISL Sacramento Knights, ARCO Arena and Senior PGA Tour Gold Rush Classic. As an introduction to the world’s game, Hinchey first worked in soccer in the summer of 1994, when he held the position of Assistant Press Officer for the FIFA World Cup during all competitions, including the Final at the Rose Bowl in Los Angeles. Hinchey serves on the Community Leadership Board of the American Diabetes Association of Colorado. A native of northern California, Hinchey and his wife Mia are the proud parents of six children.